Delphi 7 优化精简全功能版,以保持和官方原版一致的完整功能的基础上尽量优化作为目标.包含帮助,以Lite Medium Edition为基础,支持Lite Medium Edition一切特性,增加支持Rave 5 Report,FastNet,QuickReport,IntraWeb,Decision Cube;支持Just in Time(JIT)调试;增加Demos示例;增加BDE及BDE DB Data samples,几乎和原版一致,适合不太喜欢被精减内容的朋友. 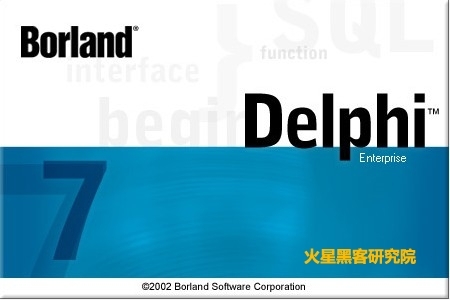 + Delphi IDE 插件 DelphiSpeedUp to 2.78.(IDE加速). + Delphi IDE 插件 DDevExtensions 1.61.(增强IDE中工程的设置及编译,可为工程增加不同版本编译配置如release/debug版). + Delphi 专家 GExperts 1.33.(超级IDE专家). + Delphi 专家 DelforExp 2.5.(代码格式化工具). + Delphi 专家 CnWizards 0.9.4.549.(超级IDE专家,支持源代码结构高亮连线显示,能自动备份恢复已安装控件信息,制作自己绿化版delphi的好工具(非必需)). + Delphi 工具 DelphiDistiller 1.77.(选择IDE启动时加载的控件及设置工具). + Spy工具Microsoft Spy++ v7.1和Spy4Win(Spy for Window) v0.20b. + DLL导出函数查看器DLL Export Viewer v1.30. + 包含绿色版注册程序(D7LiteReg***.exe),同样可适用于绿化注册其它Delphi7版本,如DELPHI 7 SECOND EDITION v7.2. + BDE (Borland Database Engine 5.2), 及相关工具BDE Administrator, SQL Explorer, Database Desktop, SQL Monitor, Data Pump等. + Newly Delphi Features Extented Components,移植自Delphi7以上版本新增的控件,如Vista Dialogs等,让Delphi7也可以开发Vista风格对话框的程序. * 支持现在所有正在使用的 Windows 版本:Win7, Vista, XP, 2008, 2003, 2000, Me, 98, 和 NT 4.0,(Vista+下支持UAC). * 集成VCL Fix Pack 1.3,需要在工程中手动引用单元VCLFixPack.pas. * 集成Midas Speed Fix 1.2,需要在工程中手动引用单元MidasSpeedFix.pas. SHELL LITE :: Microsoft Shell Lightweight Utility API, v.1.2/SNMP :: Microsoft headers for Simple Network Management Protocol definitions/WINSOCK 2 :: Winsock 2 API (Windows Sockets).